We’re going to go low budget today. We’re talking way low budget. Like Ramen Noodle budget low. 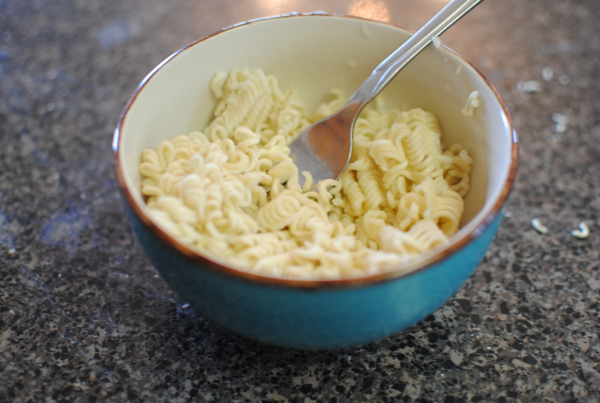 You know what I’m talking about…the magical noodles that come in handy when money is tight or you just don’t want to cook. I got this idea from my step brother who was low on ingredients for a chimichanga and came up with this concoction. He shared one with me and I was pleasantly surprised at how yummy they were. I have to admit that the thought of Ramen noodles in a chimichanga didn’t exactly sound that amazing to me. But once I tried, I was actually excited to make my own. 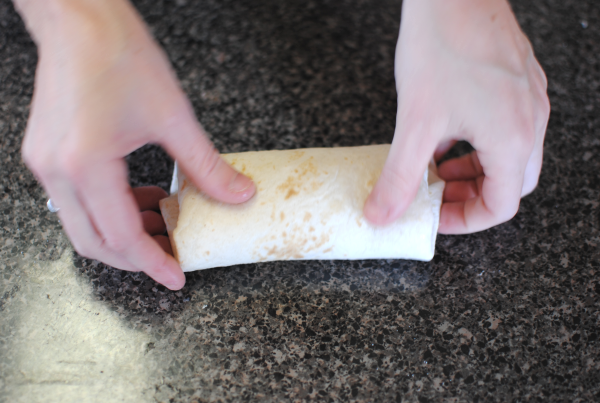 Even if you’re not too keen on putting Ramen noodles in your chimichanga, you can at least see below from instructions on how to fold a chimichanga. But I think you’ll want to give these a chance y’all. They are surely worth it! It all starts with those college-esq Ramen noodles. Which by the way, are quite tasty! I haven’t made them in so long and when these came out of my microwave, I seriously had to stop myself from eating them all. Cook them up according to the package including the seasoning. Easy and cheap way to get that great flavor inside the chimi. 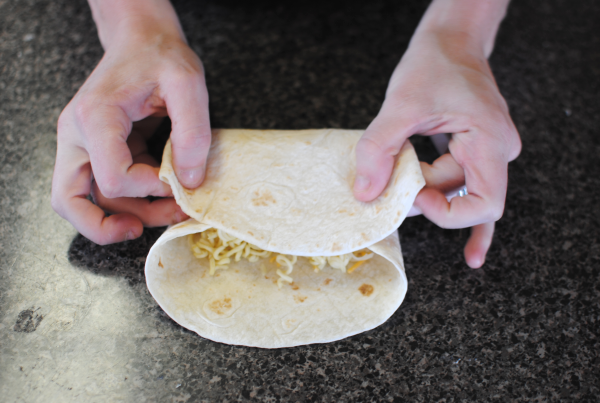 On each tortilla, you place some of those Ramen noodles along with some seasoned grilled chicken and shredded cheese. YUM! Then it’s time to roooooooooll them up for baking. Lay your tortilla flat. Fold the sides in towards the middle. 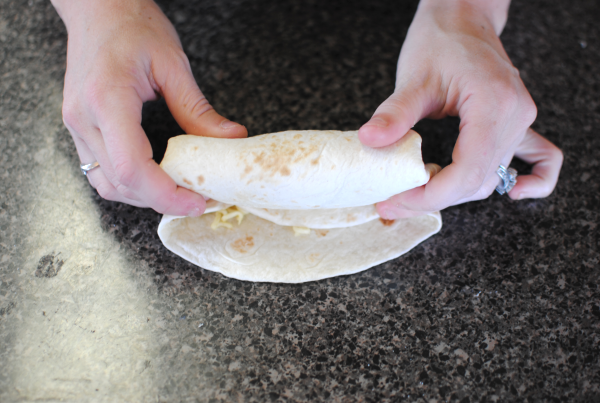 Then fold the bottom towards the top, but only halfway. 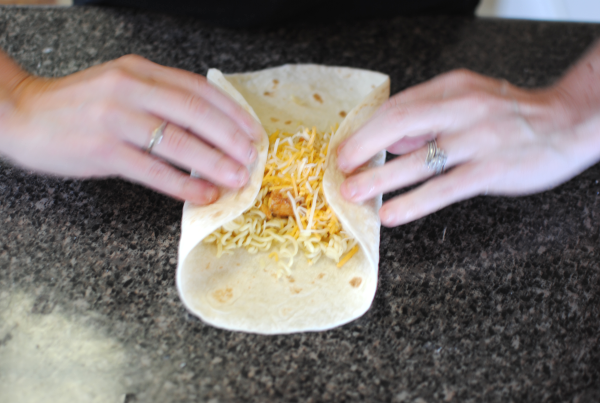 Fold the edge towards the inside and begin to roll. Once you get the rolling down, it will look like this. Place them seam side down on your baking sheet. Spray them with a little cooking spray to help them brown and get a little crunchy. 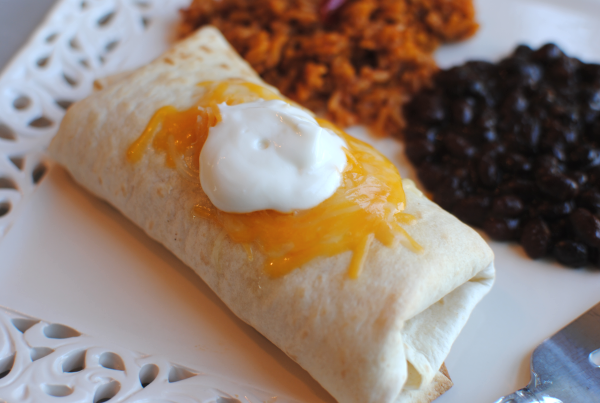 Serve with your favorite fix-in’s like more cheese or sour cream on top and viola. So easy, cheap, and great for freezing too! 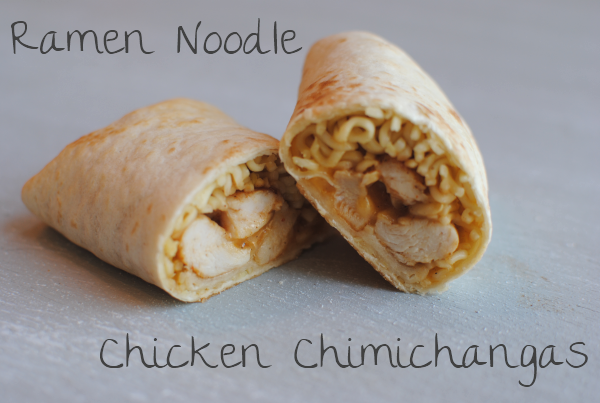 Using a low budget ingredient, Ramen noodles make a great addition to chicken chimichangas! Cook Ramen Noodles according to the package directions. Drain all liquid from the noodles and set aside. Meanwhile, in a skillet heated to medium-high cook chicken in olive oil along with the minced garlic and chili powder until no longer pink. 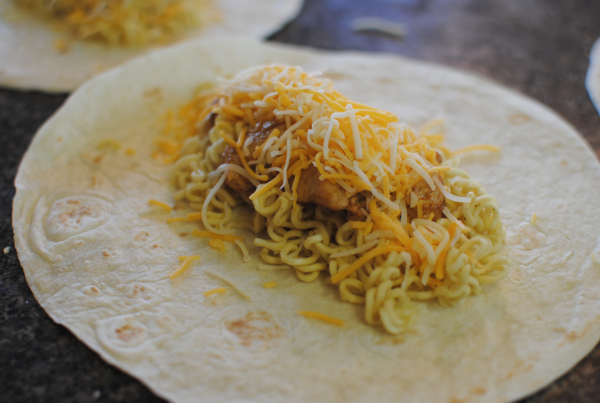 On each tortilla place 1/4 of the Ramen noodles, 1/4 of the to chicken, and 2 tbsp shredded cheese. 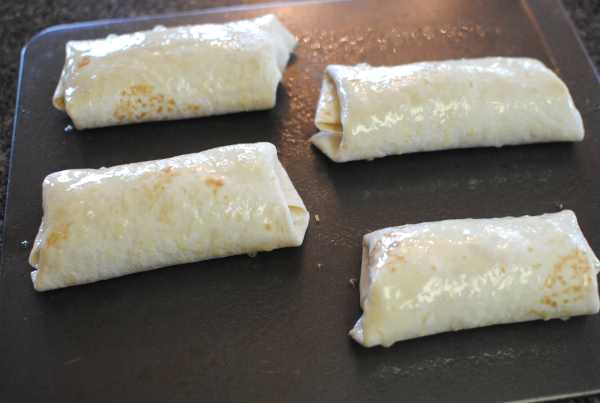 Roll up into chimichangas and place seam side down on a greased baking sheet. Spray tops with cooking spray and bake for 10-15 minutes until browned and crunchy. If you like spicy things, you can use jalapeno cheese like my step brother to add a little kick! 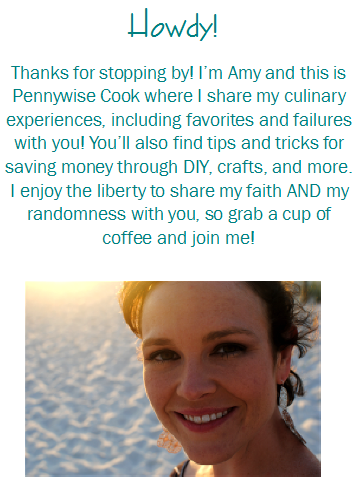 I love this recipe and the pictures. I’m definitely adding this to my ‘to make’ list. Little bit of friendly criticism though… that’s not a chimichanga if you bake it. Chimichangas are deep fried. That’s just a baked burrito 🙂 But, it still looks delicious though. I personally would prefer to bake than deep-fry anyway.